View PCL/HPGL/PCL3GUI, AFP, PDF, Postscript, TIFF/FAX, JPEG, PNG and Text. Convert PCL to PDF, TIFF, AFP, PNG, JPEG, PCL, HTML, XML or Text. Recover text and xml from PCL documents. Automate with batch mode operation. 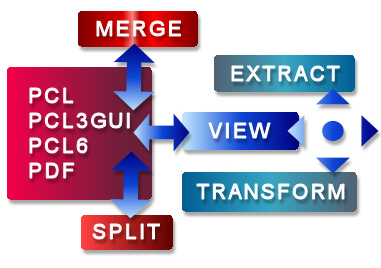 If you just need view a PCL data stream or convert PCL to other formats then EscapeE is the answer but it does much more. Powerful automation features make EscapeE the program of choice for integration with 'industry strength' document management and OEM applications.